Free PDF to Word allows you easily and quickly to convert all your PDF files into Microsoft Word document, while maintaining the same quality of the original PDF file, with text and all images. The converted word file will be easily edited via any version of Microsoft Word. 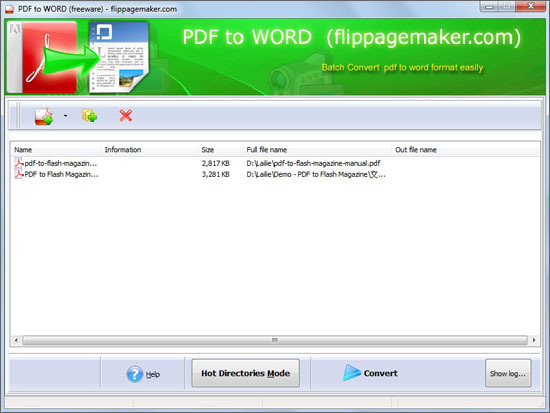 This free PDF converter and Word creator is quick and reliable. We developed this application because there are some people who do not have any PDF editor. Then they need to transfer the PDF document to easy-to-edit Microsoft Word document. Command Line Mode: using command line to convert PDF to Word. Original file contents such as text, image, and table will be retained well after converting. All the text would allow editing in the exporting Word document too. Our freeware will not add, delete, or modify the content of the file you import during the entire process of transform. 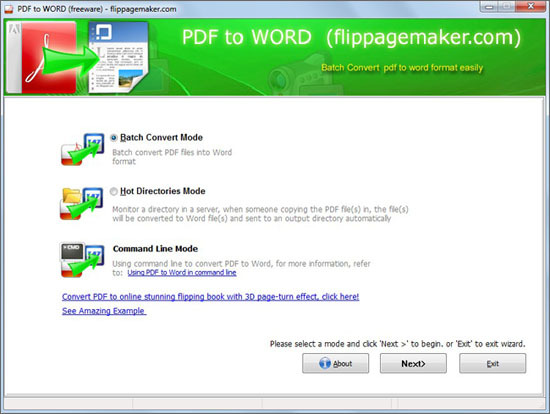 The main function of this software is converting PDF to Word. So it is easy to operate and is able to meet specific need. No any other plug-in application is required to install and use it on your computer. There is also not many complicated button, only several serviceable for importing and deleting files. The user-friendly interface enables green hands to use it much easily. Step4: view the output Word file. Copyright © 2015 FlipPageMaker Software Co., Ltd. All rights reserved.